The new Aim Solo 2 track day racing lap timer receives the data from two satellites constellations, GPS and Glonass: this is a huge step forward since it is unbelievably faster and more precise than the previous version. The power ON requires only a few seconds and the lap times are calculated with a max 2/100 sec of tolerance. 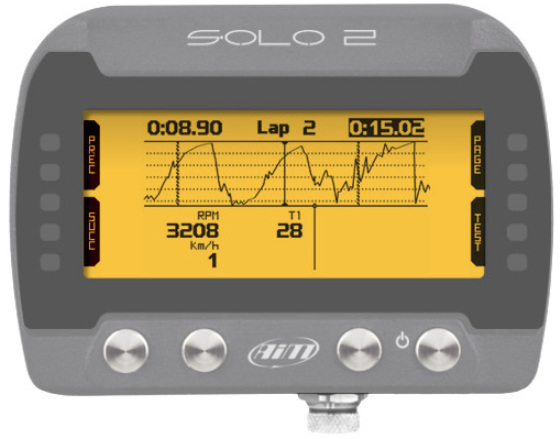 Aim Solo 2 track day racing lap timer can rely on a database of more than 3,000 tracks all over the world: as soon as it switches on, Solo 2 identifies its position, recognises the starting line coordinates of the track and starts sampling lap times. In the event that the track is not in the database then no problem. Solo 2 realises it and enters into the auto learning mode, automatically understands the characteristics of the track and gives the lap time anyway. 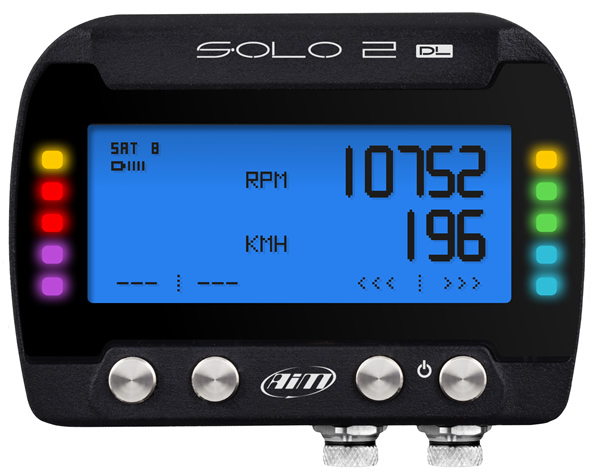 The Aim Solo 2 configurable RGB LEDs, will give you a clear and fast indication of the comparison with your best lap. Aim Solo 2 track day racing lap timer can manage different types of races, Speed races in a closed circuit, Point to-point races, Regularity, Performance tests (0-100 km/h etc.) In each of these configurations, Solo 2 gives you the correct information during the test and powerful data review immediately after each session. 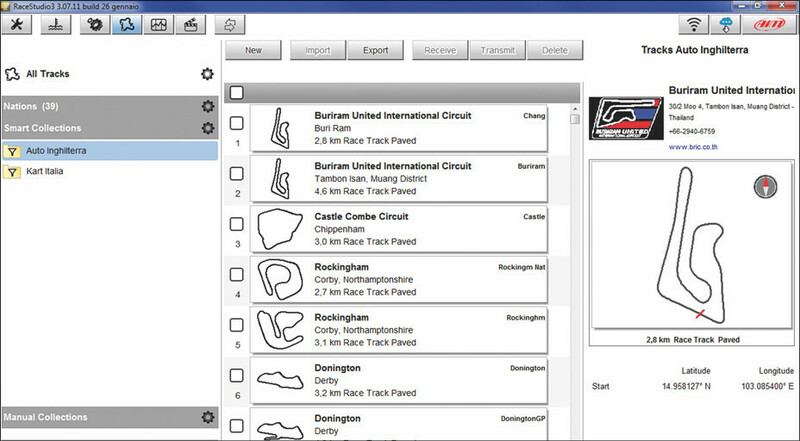 Simply the best way to configure your Solo 2, to manage the track database and to download the data to your PC. Use your iPhone for a quick and comfortable data analysis, for managing the track database and even for an On-Line view of the most important parameters of your Engine (in case you have chosen the Solo 2 DL). In the event that the track is not in the database then no problem. Aim Solo 2 track day racing lap timer realises it and enters into the auto learning mode, automatically understands the characteristics of the track and gives the lap time anyway. There is more than 1,000 protocols for over 1,000 ECU’s in the database to allow the Solo 2 DL easy connection to your Engine Control Unit providing you a lot of information with just one cable. Where your ECU protocol is not in the database, an ECU Driver Builder is always available in the Race Studio 3 configuration software which you will be able to create your protocol by yourself. This gives you access to a huge amount of data from your car that can be overlaid with GPS data to create an incredibly powerful analysis and learning tool! OBD2: the standard vehicle diagnostic port beneath your dash supplies the Solo 2 DL with a wealth of information. This is the standard cable most people will use. CAN/RS232: the Solo 2 DL can be connected to your CAN Bus for an even richer, broader spectrum of information than OBD2. This cable can require a bit more know-how to connect, however. Coil RPM: the Solo 2 DL now features a digital input allowing to log RPM either from square wave signals (8-50 V each signal) or pulse signals (150-450 V ignition coil trigger – primary circuit).